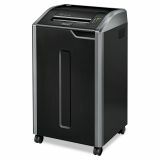 Fellowes Powershred 425i 100% Jam Proof Continuous-Duty Strip-Cut Shredder, TAA Compliant - Strip cut system reduces sensitive documents to thousands of 7/32" strips which compact naturally. 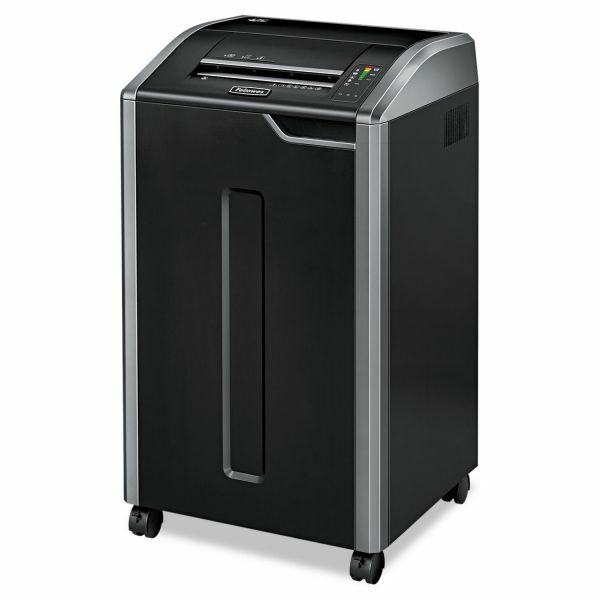 Provides superior shredding performance for large offices with 10 or more users. Spend less time emptying the waste and use fewer bags. Equipped with an automatic start/stop for convenient one-handed operation. C-425 is powered by a continuous duty Powershred 1.9 hp thermally protected motor. Shreds up to 36 to 38 sheets per pass at a speed of 20' per minute. Extra-wide 12" throat permits easy feeding of documents including continuous 80 column computer forms. Durable, hardened-steel cutters accept credit cards, staples and small paper clips while a designated safety slot accepts CDs. Shredder shuts off automatically and alerts operator with troubleshooting indicator lights when a jam occurs, door is ajar or 32-gallon waste bag is full. Turbo Jam Release button for a fast, easy way to clear jams. Door offers holder for oil, manual and shredder bags. Extra-large wastebasket pulls out for easy waste disposal.